Finally, a fairy-tale retelling that delivers! With slow-burning intensity this novel got under my skin, with gorgeous prose and a strong, fascinating leading lady. A brilliant example of YA storytelling at its best. 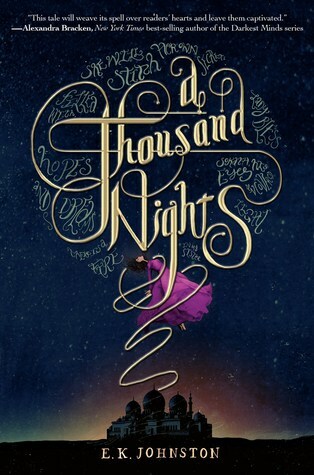 The tale of A Thousand and One Nights is a favourite of mine, and this version, though different, takes the story in a beautiful direction that I have embraced whole heartedly. It keeps the essence of the story and weaves it into legend, bringing readers on a journey to remember. The other thing I loved was that the protagonist remained unnamed. Just as this writing device enchanted me a year ago which reading Rebecca, it did so again. In a story that feels like a parable, like a tale told around a campfire from mother to daughter, it is the perfect way to help readers feel her struggles and her strength. It also helps readers to see more of themselves in her than they might otherwise, given the setting of the desert is one very abstract to the Western readers this is marketed at. The only criticism that I can level at this book is that at times the plot felt a little thin, and the pacing a little slow. It’s not a long novel, so Johnston could have included more detail about the tales, but after reading the epilogue I think the balance is almost right for the kind of atmosphere of oral history that she was trying to evoke. Overall I really enjoyed this book and would highly recommend it to teens and older lovers of YA alike. It’s probably not going to suit those who don’t enjoy the ‘lightness’ of many YA stories, but as a fence-sitter on the YA genre this had enough creativity and substance to keep me entertained, and still thinking about the story long after finishing it.